It is a double walled unit with inside made of thick S.S. sheet and outer of M.S. sheet duly enamel painted he paramedical lid made of S.S. prevents falling of condensed water droplets on the specimens. Heating is achieved through a immersion type heater and the temperature is controlled by "EGO"/JUMO GERMAN hydraulic type thermostat with an accuracy of + 0.5°. The bath has an oscillating tray riding on bass rollers oscillated through a geared variable speed motor. Shaking speed range is between 40 to 140 cycles per minute. The shaking tray can either hold test tubes or Erlenmeyer flasks of 25mlk or 50ml or 100ml or 250ml or 500ml or 1000ml as ordered by the users. (Kindly maintain the capacity of the flasks while ordering). Supplied complete with one shaking tray, paramedical cover, L shaped thermometer cord and plug, to work on 220/230 volts A.C. supply. Available with heating arrangement only (having temperature range from ambient to 100°C) or with both heating and cooling arrangements (having temperature range from 5° to 100°C). 2. Gap between the two walls filled with high quality fiber glass wool. 3. Powered by continuous duty, variable speed self cooled PMDC Motor with speed control up to 200 Oscillations per Minute. 4. Adjustable step less strokes from 0 to 2". 5. Speed is continuously variable from 50 to 200 RPM and displayed on a Digital Speed Meter. 6. Supplied with Stainless Steel pyramid type cover. 7. Unit works on 230 V AC, 50 Hz. Supply. 1. 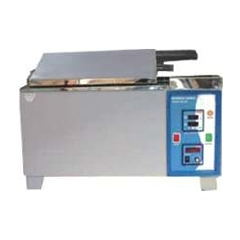 Water Bath Incubator Shaker has highest level of performance, flexibility and control for most demanding applications. Minimum Noise and Vibration is ensured by Specially-designed shaking mechanism. 2. Electronically Controlled Shaking Mechanism provides Quiet Reciprocating Motion and Precise Speed Control. 3. User's Self-compensation function to control difference between real temperature and indicated temperature. 4. Stainless Steel Bath for superior Durability & High Thermal efficiency. 5. Industrial grade energy efficient heaters reduces power bills drastically. 7. Space between the walls is filled with special grade mineral wool in order to avoid thermal losses.